IF THERE is a consensus bet for 2014, it is that equities will continue to outperform government bonds, as they did in 2013. But the odd thing is that, if investors relied on the usual fundamental factors, the evidence would seem to point in the opposite direction. Take equities, where the strength of corporate profits might seem the most crucial factor for returns. Thomson Reuters recently calculated that 103 companies in the S&P 500 had issued negative guidance on profits compared with just nine that have been positive—the worst ratio on record. Analysts are downgrading their forecasts for fourth-quarter profits at a rapid rate. But the bad news has barely affected the buoyant stockmarket. When it comes to bonds, inflation has generally been the key determinant: rising prices reduce the buying power of fixed-interest payments and principal. The 1970s was a catastrophic decade for the bond markets. 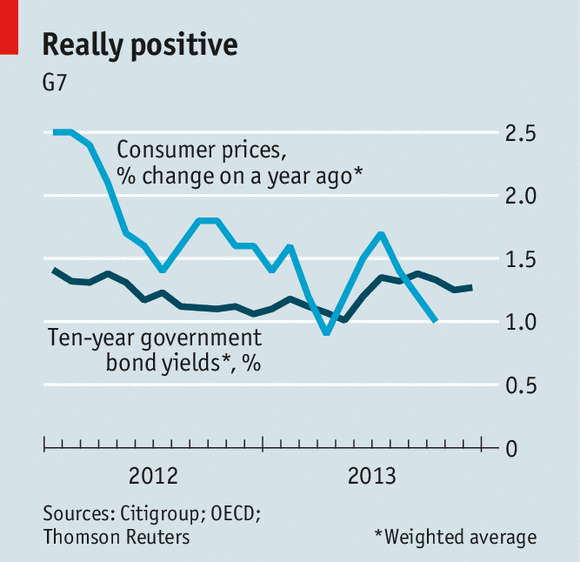 But in 2013 the general trend has been for inflation to fall, while bond yields have risen (see chart). That is an odd combination. Headline inflation in America is just 1.2%; even in Britain, for the first time in four years inflation is almost back to the Bank of England’s 2% target. The decline in inflation has been so remorseless that parts of the developed world may be slipping into deflation. Both Greece and Cyprus have had an extended period of falling prices. Dario Perkins of Lombard Street Research used an index of deflation risk, created by the IMF back in 2003, to assess whether the rest of the euro zone faces the same danger; it puts the chance of falling prices at 50% or more in Estonia, the Netherlands, Portugal and Spain. Deflation is a problem for highly indebted economies because the value of debt is fixed in nominal terms, but the ability to service it suffers as incomes decline with prices. Furthermore, because central banks cannot force interest rates below zero, deflation means that real interest rates must always be positive. With its ageing population and sluggish growth, the euro zone bears a worrying resemblance to Japan. Japan’s banks shrank their balance-sheets in the early 1990s as its bubble deflated; Europe’s banks seem to be following the same path. In the euro area, loans to the private sector fell by 1.4% in the year to October, while loans to non-financial companies fell by 3.7%. Broad money-supply growth slipped to an annual increase of 1.4% from 2% in October. Japan’s recent policy shift may also exert a mild deflationary influence on the euro zone. The introduction of Abenomics has caused the yen to weaken; it has dropped by 22% against the euro in the past 12 months. That makes Japanese exports more competitive, putting pressure on European businesses. Lower import prices have a positive side. To the extent that they reflect lower commodity prices, they are good news for consumers. The effect is equivalent to a tax cut. But they make it more likely that the euro zone could fall into outright deflation; with the headline rate at 0.9%, there is little margin for error. Deflationary scares have in the past been good for government bonds. But the market seems more worried about the actions of the Federal Reserve, which is expected to slow its asset purchases over the course of 2014 (its open-market committee was meeting as The Economist went to press). It is difficult to tell to what extent bond yields have been depressed by this “quantitative easing”. But since the Fed hinted in May that it might soon slow its spending, yields have risen by around a percentage point. On a crude measure (subtracting the current inflation rate from the ten-year yield), real Treasury yields have risen by almost three percentage points since the start of 2012. At around 1.7%, the real yield on ten-year Treasuries is close to the average real return American fixed-income investors have earned since 1945. In contrast, American equities are trading at a cyclically adjusted price-earnings ratio of 25, well above the historical average at a time when, as already noted, profits are coming under pressure. In the past investors who bought shares trading at such a high multiple barely earned a positive real return over the subsequent ten years, according to Cliff Asness of AQR, a fund-management group. And yet investors are increasingly taking money out of bond funds and piling into equities. They seem convinced that economies are returning to the Goldilocks conditions of the 1990s in which growth is strong while inflation is positive but subdued. There is scope for a nasty surprise in 2014. The long farewell to quantitative easing, one of the most remarkable experiments in the history of macroeconomic policy, starts now. In the wake of the strong US employment data in recent months, the Federal Reserve finally announced that it will taper its asset purchases from January onwards. The Fed’s balance sheet will stabilise in 2014, but will not begin to decline for several more years. Variously described as the saviour of the global economy, totally irrelevant, a drug for the financial system or the harbinger of future inflation, QE is still controversial and insufficiently understood. Macro-economists are destined to be studying its effects for decades to come. Here are some early reflections. When Lehman Brothers collapsed five years ago, the central banks immediately flooded the financial system with unprecedented amounts of liquidity, through open market purchases of debt, emergency repo facilities and direct lending through their discount windows. The term “quantitative easing” was not commonly used at that stage, but the Fed’s Ben Bernanke, the Bank of England’s Mervyn King and others knew enough economic history to realise that they had to accommodate the sudden rise in liquidity preference in the banking system. There was an awareness that the Fed’s failure to do this in 1931-33 had caused a massive deleveraging of the banking system as banks scrambled for cash, and that the resulting implosion in the money supply and bank credit had probably caused the Great Recession. The banking system as a whole could only increase its net holdings of liquid assets against an outside agency, the central bank, because otherwise a rise in one bank’s liquid assets would have been cancelled out by a rise in another bank’s liquid liabilities. Fortunately, Mr Bernanke and others recognised that this required an increase in commercial banks’ liquid assets at the central bank, which involved a rise in the monetary base. Their willingness to permit this to occur prevented another Great Depression, a signal achievement for modern monetary policy. The story continued in 2009 with a realisation that monetary conditions needed to be eased further, but by now short-term interest rates had reached the zero lower bound, or ZLB. Many economists thought that further expansion of the monetary base became irrelevant at that stage, since the Fed was simply swapping one form of short-dated government liability (money) for another (debt). But the Fed refused to accept this, and it pressed ahead with what it called “credit easing”. In 2009, in what is now termed QE1, attention turned to buying longer-dated assets, in an effort to reduce credit spreads and remove bad assets from the balance sheets of the banking sector. This also worked. Confidence in the banking system began to improve, mortgage interest rates fell and credit spreads narrowed. Many observers warned that the resulting further increase in the monetary base would have damaging effects, including moral hazard in the banking system, and rapidly rising inflation. The latter, at least, did not happen. Broad money aggregates failed to rise in line with the monetary base, so money multipliers in the economy collapsed, as they had in Japan in similar circumstances in the previous decade. Inflation expectations did not rise in line with the monetary base either. The central banks became more emboldened by the early success of their interventions. By 2010 another problem was looming. Government budget deficits had doubled or tripled as a result of the recession, and some deliberate fiscal easing. But the major economies were slowing again, and the central banks, refusing to accept the constraints of the ZLB, wanted further reductions in long-term interest rates. In November 2010 the Fed announced QE2, explaining that it expected this to work through portfolio balance effects. They would remove bond duration from the hands of the private sector, inducing investors to seek other forms of risk assets, thus reducing risk premia. This step was bitterly criticised by economists from several different quarters. Some thought it would be irrelevant, because the Fed’s purchases would have no meaningful effect on bond yields in the massive Treasury marketplace. Others thought it would involve fiscal dominance over the central banks, which would end in an inflationary crisis of the type we are now witnessing in India. Still others warned that it would result in an unhealthy reach for yield which would create bubbles in parts of the financial system. Initially, most of these warnings once again proved false. The central banks began to argue that they had discovered a new form of monetary easing, which could be calibrated by adjusting the size of their balance sheets. The extent of the easing, they said, should be measured by the absolute size of the outstanding stock of purchases, and not by their rate of change. Long-term bond purchases were increased further in Operation Twist in September 2011 and by QE3 in September last year. This final phase of quantitative easing was particularly audacious, since it involved an open-ended commitment by the Fed to buy long-term bonds until a substantial improvement in the labour market outlook had occurred. Mr Bernanke, in his final year as Fed chairman, was determined to shock the economy into a recovery, in the face of a large fiscal tightening. These programmes appeared to have profound effects on asset prices, with market sentiment becoming hooked on the details of each new announcement by central banks around the world. Every shade of investor became an expert in the balance of views expressed in the dense minutes of the Federal Open Market Committee. The growth of the monetary base seemed to be very closely correlated with the performance of equities and other risk assets. Some said that this was only because the asset purchases had powerful “signalling effects” about the future intentions of the central banks in the area of interest rates, while others took the commonsense view that printing money to buy assets would lead to an artificial rise in their prices. We still do not know which of these explanations is the right one, but we do know that the rise in asset prices helped to sustain aggregate demand at a time when this was much needed. We also know that it involved large redistributions of wealth in ways which were not intended and are still controversial. Savers lost out as borrowers gained from exceptionally low real interest rates. Some described this as a form of financial repression, a slow form of debt default. And it began to involve bubble-like activity in asset markets, including in emerging market debt and some credit markets. The Fed has now declared victory, believing that there has finally been a substantial and self-sustaining improvement in the US labour market. It is hard to see how this could have occurred without QE, but the benefits of the policy are now fading. A significant number of FOMC members, led by Jeremy Stein, started to believe that the reach for yield in US credit may have been allowed to proceed too far. On May 22 the markets began to realise that Mr Bernanke was serious about tapering before the end of this year. The “taper tantrum” occurred. There was a wobble when the Fed refused to act in September, but this is a promise which has now been kept. It only took the merest hints of tapering in the summer to cause the 10-year Treasury yield to rise by 120 basis points, thus reversing the full effects of QE on the term premium before a single bond had been sold. An interesting development, worrying for the future, is that forward guidance on the path for short rates was not been able to prevent this. The summer meltdown in emerging markets was a powerful warning shot that the exit may not be painless for markets, though the early indications this week have been that tapering may now be priced in. Many investors currently believe that tapering will be a non-event, with the end of the bull market only being triggered when short-term interest rates begin to rise, heralding a genuine tightening in monetary policy. A final verdict on QE cannot yet be offered. In its initial stages, it was essential and clearly beneficial. In its middle stages it was still effective, but the effects were not as profound. And in its last phase, it started to have some adverse effects, while the benefits were petering out. Finally, the exit still has to managed. The Fed does not intend to reduce the size of its balance sheet for several years, and the BoE’s Mark Carney recently said that in the UK the central bank balance sheet may be permanently higher than it was before the crisis. In that event, a part of the budget deficit will turn out to have been permanently monetised, something that has always been vehemently denied by the Fed. In public, central bankers still sound confident that the exit can be managed as a simple reversal of the entry. Technically, this is valid, but the politics of exit may not by symmetrical to the politics of entry. There is a danger that the independence of central bankers will be compromised when they seek to take actions such as the sale of government bonds which are inconvenient for politicians. In a bad outcome, fiscal dominance over the central bank might yet rear its head. Quantitative easing has demonstrated to politicians everywhere that it is possible to finance government deficits simply by printing money, a fact which had become obscure in the developed economies in previous decades. The umbilical link, previously unchallenged, between running a budget deficit and the requirement to sell bonds has been broken in the mind of the political system. Who knows what the long-term effects might be. PARIS – A French business magazine recently ranked IMF Managing Director Christine Lagarde the most internationally influential French person alive – well ahead of President François Hollande. While politics may have influenced that particular decision, there is no doubt that Lagarde is at least the most prominent French woman alive. Lagarde’s competition in this category is not particularly stiff. Valérie Trierweiler, Hollande’s partner, came to prominence with an ill-judged political tweet about her predecessor, but has since retreated behind the Élysée Palace’s firewalls. And Brigitte Bardot is not quite the force of nature she once was. But this may be about to change. The European Parliament has just confirmed the appointment of the Bank of France’s Danièle Nouy as the first head of the European Central Bank’s new supervisory board. The announcement comes less than a month before the ECB takes over direct supervision of some 130 banks, representing more than 80% of eurozone bank assets, leaving only smaller national banks under the jurisdiction of local supervisory agencies. Nouy (with whom I have worked) is a knowledgeable and capable supervisor, equipped with a formidable combination of determination and charm. She will need all of these attributes and more to make Europe’s new banking system function efficiently. The ECB was chosen as the Single Supervisory Mechanism, despite the wafer-thin legal basis (an ambiguous clause in the Lisbon Treaty) for its new responsibilities. When the Lisbon Treaty was signed, Germany was wholly hostile to giving the ECB such a role. But no one wanted to contemplate the monumental task of framing a new treaty to establish an institution with the needed authority. That process would have included popular referenda – and thus the risk that the vote might not go the Eurocrats’ way. Despite enduring legal doubts about the ECB’s powers, the need for a central supervisor is widely agreed. The credibility of Europe’s national supervisory agencies has been irreparably damaged in recent years, owing to financial stress tests that gave clean bills of health to institutions – Laiki Bank of Cyprus and Bankia of Spain, among others – whose balance sheets were later found to have enormous holes. If the ECB is the eurozone’s lender of last resort, Europe’s leaders agreed, it must have direct knowledge of its potential clients’ balance sheets. It might also be expected to take a more objective view of the institutions that it supervises – one that is insulated from the influence of national politics. So far, so good. But the ECB needs support to do its job. At the recent European Banking Conference in Frankfurt, there was near-unanimous agreement that a functioning banking union requires a central resolution authority (to deal with failing financial institutions) and a mutually guaranteed deposit-protection fund (to boost confidence in weaker banks in the eurozone’s troubled economies). But there was also near-unanimous agreement that Europe’s banking union would not meet either of these needs – at least not at the outset. The logical French are pushing the parsimonious Germans hard, and a compromise may be reached, but it remains an uphill battle. Making matters worse, the ECB’s decision-making mechanisms are poorly suited to the role of banking supervisor. It has been agreed that each bank will have an ECB-led supervisory team – responsible for making recommendations on issues like capital requirements, risk weighting of particular assets, and the fitness and propriety of directors and senior managers. A new supervisory board, including ECB officials and each eurozone member country’s head of banking supervision, will be established to receive these recommendations. But everything will have to be put to the ECB Governing Council for non-objection or approval. And the Governing Council is not accustomed to making quick decisions on unanticipated issues. Its main responsibility, after all, is to set monetary policy, which involves a small number of very important decisions, usually made on a pre-set timetable. Indeed, given that monetary policy works by influencing market expectations, maximizing such decisions predictability – at least in terms of timing and guiding principles – enhances their effectiveness. Supervision is a far messier business, demanding decisions at unexpected times. Moreover, decisions interact with each other, and often require amendment and clarification. Waiting for a stately decision-making process to unfold each month could cost money and harm depositors’ interests. To borrow the philosopher Isaiah Berlin’s famous taxonomy, a supervisor is like a fox; it knows many small things, is flexible, and constantly adapts its survival strategy. A successful central bank is more like a hedgehog; it knows one big thing – that it must remain focused on low inflation. Slow and predictable decision-making is a virtue for such a creature, but it is maladapted for the fast-moving and complex world of twenty-first-century banks. So the real challenge facing Nouy in her new role at the ECB is to teach the hedgehog new, fox-like tricks. Ideally, she would be aided by a revised decision-making structure, with a new seat of authority able to support the supervisory teams with fast rulings. But the need to avoid treaty amendments rules this out. One hopes that the new supervisory board can grow into its role – and that the ECB Governing Council will give it the space to do so. The future of Europe’s banking system depends on it. Howard Davies, a professor at Sciences Po in Paris, was the first chairman of the United Kingdom’s Financial Services Authority (1997-2003). He was Director of the London School of Economics (2003-11) and served as Deputy Governor of the Bank of England and Director-General of the Confederation of British Industry. Citi’s cost-cutting drive has delighted investors but how much more can it cut before it squanders its global advantage? The fireplace on the 39th floor of Citigroup’s Manhattan skyscraper is a relic from a different era. It was installed by Sandy Weill, who indulged a passion for high-rise hearths, martinis and cigars during the acquisition spree that culminated in him co-founding the modern Citi in 1998, back in banking’s boom years. Sitting next to it – unlit – on a winter’s day in 2013 is Mike Corbat, a very different chief executive for a more austere time: post-crisis Wall Street. Mr Corbat, 53, was promoted to chief executive last year after Vikram Pandit was ousted. After five years of retrenchment under Mr Pandit, Citi is still the world’s most sprawling bank, with traders spanning the globe and retail branches stretching from Seoul to San Francisco. Mr Corbat has found plenty left to cut. Under his leadership, Citi has announced 11,000 job losses and introduced targets for executive bonuses that require the bank to meet a return on tangible equity of 10 per cent by 2015, up from 7.9 per cent last year. Such a goal would allow it to approach the profitability of the sector’s leaders, such as Wells Fargo, Goldman Sachs and JPMorgan Chase. While he has not announced a new strategic direction, Mr Corbat has started to retreat from countries that are underperforming, closing consumer operations in Uruguay, Paraguay, Romania, Pakistan and Turkey. “We’re going to stay focused on expenses and making sure we’re getting investments in the right places, but we’re just not going to be out there spreading the peanut butter in terms of expense growth because it’s not warranted. It’s not what you need,” says Mr Corbat, a gentle smile softening the imposing 6ft 3in frame of the former college football player. For the most part, investors and analysts are supportive of his emphasis on execution and efficiency, sensing Citi is about to return a significant amount of capital to shareholders for the first time since the crisis. “It’s not rocket science. It’s the way managements should look at the business,” says one top-20 shareholder. Early results have been good, with caveats. Losses bleeding from bad assets are close to being staunched as they are sold off but, Mr Corbat cautions, “I would guess the pace of that’s going to decline”. Earnings are up, costs are down and the shares have traded at their highest level since the company narrowly avoided failure amid spiralling losses in 2009, rising 50 per cent since Mr Corbat took over in October last year. After leading its peer group in the first few weeks of the new chief executive’s tenure, Citi’s stock has now settled back into the middle of the pack. But according to eight current and former senior executives, an internal debate is raging over whether the new regime’s drive to cut costs and improve profitability is jeopardising the long-term future of Citi. Mr Corbat’s detractors say that, even in the leanest years, more investment was found to preserve Citi’s strongest businesses and finance new growth. How much can America’s most international bank, which is active in more than 100 countries, retrench before it squanders its reason for existing? Citi was already on a diet. Under Mr Pandit it had placed an enormous $700bn of non-core assets and toxic loans in Citi Holdings, a bad bank, and set about selling them off. Much of the improved performance today is the legacy of the reduction. And many of the decisions to close operations in various countries, announced to great fanfare over the past 12 months, had been taken by the old regime. No other bank in America comes close to Citi’s international presence and outside the US its only rival for global reach is HSBC. Accompanying multinational clients as they travel the world has helped Citi build a foreign exchange trading operation with more than 80 local desks, with a particular strength in Asia. Its consumer operations encompass a vast business in Mexico and large operations in the US and South Korea. Perhaps most important of all is a business considered boring next to the rest of Citi, but ultra-dependable too: the transaction services operation, a network that allows companies to manage their cash in different countries. Insiders say that the transaction services business has returns on equity which, at more than 30 per cent, the rest of the group dreams about. The Mexico business was a $12bn acquisition in 2001. The transaction services business was built over decades by predecessors such as Walter Wriston, chief executive of Citicorp between 1967 and 1984, and John Reed, who followed him. Neither the big-ticket purchases nor increasing investment in technology are orders of the day now. Citi can cut its way to improved profits – that was already well under way under the previous management team – but where is the next strategy? In the consumer business, Citi has revamped its retail network in much of Asia with sleek, modern, technologically advanced branches and kiosks, which take up less space and require fewer staff. “The goal was to do exactly the same in the US,” says one executive, who adds that rollout reached a lone branch in New York and then halted. “These guys stopped that completely.” While Citi pauses, Bank of America is pushing ahead with its new “express” branches in the US. If “digitisation” is still part of the strategy, asks this executive, “why are you behind everyone else”? Valued executives working in those areas have left, including Michelle Peluso, who ran Citi’s digital operation but jumped ship last year to become chief executive of Gilt Groupe, the online fashion retailer. A recent analysis of the four US banks’ mobile banking platforms by Forrester, the research firm, put Citi last in a list led by JPMorgan Chase. Manuel Medina-Mora, the sharp-suited executive co-president in charge of the consumer business, dismisses the idea that the bank is missing any opportunities. “There has been no revenue growth for the US banking industry in this decade. You demand from your organisation the productivity saves that will fund more investments,” he says, denying that promises were breached. “All the investments that we approved were made.” The bank points to several awards for its online efforts and says it is increasing its digital investment. Citi’s US operations – with a diminishing physical presence and a flagging online offering – are a problem because the bank badly needs to make money in the US. Mammoth losses during the crisis produced benefits in the form of $50bn of tax write-offs, which can be unlocked only when the US business makes more money. Given the strictures on spending, there is an internal debate over how much revenue should be reliant on relaxing lending standards, according to people at the bank. They say that as only the 13th-biggest US bank by branches but the sixth-biggest mortgage seller, there is a possibility that Citi will resort to buying more mortgages from brokers rather than lending to its own customers – a riskier proposition. A Citi spokesman said that would not happen. Overseas, a lack of investment could lead to atrophy for Citi’s best businesses, although here there is a defence from stricter regulations. On the one hand they are making Citi’s international operation less efficient as each country – fearful after Lehman Brothers’ disorderly collapse that assets will be sucked back to head office during times of strife – demands more capital and funding is kept locally. But they are also making it harder for anyone to catch up. Deals such as a once-floated combination of JPMorgan Chase and Standard Chartered, the emerging markets-focused UK bank, are ruled out by regulators worried that banks are dangerously large. Replicating Citi’s transaction services network would take years, and is at least as likely to come from an emerging participant such as Itau in Brazil or China’s ICBC. “The barriers to entry have got higher,” says Jamie Forese, co-president and head of Citi’s investment bank. Some former bankers also bristle at the supposed improved execution. The most critical voices point to one of the final upsets of the Pandit era, the disappointing sale to Morgan Stanley of Citi’s stake in Smith Barney, a wealth management division that Citi said was worth $22.5bn but Morgan Stanley bought for $13.5bn. Mr Corbat was responsible for Citi’s stake in Smith Barney and ensuring its interests were protected, these people note. They argue that Morgan Stanley, as the lead shareholder in operational command, was allowed to manage it in a way that depressed the valuation. What is now certain is that James Gorman, the Morgan Stanley chief executive who coveted the business for its steady stream of revenues, got a good deal. Its profit margins have suddenly surged. A person close to Mr Corbat says he did not have operational responsibility for Smith Barney and had moved to a different role by the time its sale was negotiated – by Mr Pandit – and notes its price was decided with the assistance of an external appraiser. Two senior Morgan Stanley executives say Mr Corbat provided scrutiny and deny that the business was burdened with any additional cost: the recent improvement has been driven by revenues, they say. Whether the execution is better or worse, it is certainly a different style of management, according to insiders. “It’s sort of central planning and bureaucracy,” says one critic. While Mr Pandit would speak di­rectly to people below the senior management level, these executives now find themselves with a gatekeeper in Sara Wechter, Mr Corbat’s chief of staff. “Everything goes through his chief of staff whereas Vikram just used to pick up the phone,” says one. People close to Mr Corbat say he speaks regularly to dozens of executives, visiting 50 cities and holding four two-day “off-site” planning sessions with his top team. This agenda is set by Mike O’Neill, the chairman of Citi who orchestrated Mr Pandit’s demise and championed Mr Corbat. Passed over in the running for chief executive in 2007 in favour of Mr Pandit, Mr O’Neill has proved a more interventionist chairman than exists anywhere else on Wall Street, an industry characterised by imperial leaders such as Jamie Dimon, JPMorgan’s chief executive. The new approach earns the appreciation of Mike Mayo, an analyst at CLSA, and an arch-critic of Citi under Mr Pandit. There is certainly a profound change from the previous chief executives. Mr Pandit had grand visions despite the tight spot presented by the crisis. His predecessor Chuck Prince infamously said Citi would keep “dancing” even as it plunged headlong into the crisis. His predecessors Mr Reed and Mr Weill assembled a formidable conglomerate. Citi will have to live without a dreamer for a while.